Because you’ve paid good money for your bike and if it starts to look tatty people will tag you as a lazy idiot. A well-kept bike will always catch a buyer’s eye, and gives you ammunition not to drop your asking price when you want to sell it. 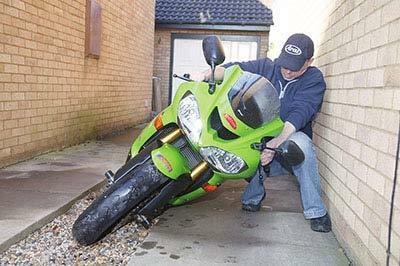 The simple fact is if you look after your bike it will look after you – cleaning your bike means you get more intimate with it, so you’ll spot any faults which can be hidden behind muck and the fairing panels. 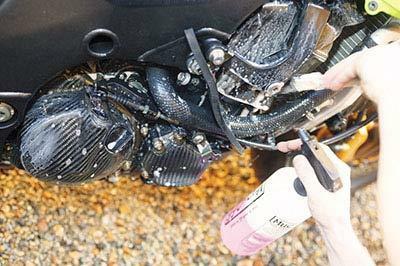 Ideally a pressure washer or a high-pressure spray nozzle, a cut-down 2in paint brush and degreaser (e.g Jizer, Gunk) to get any chain lube/grease off the bike, cleaning agent to loosen baked-on crud (Castrol Green, Muc-Off etc), car/bike shampoo (not washing-up liquid as it contains salt) and an absorbent cloth to soak up excess water. 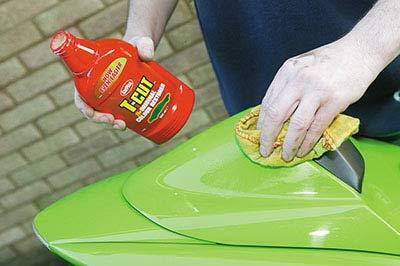 Metal polish and T-cut paint restorer for a perfect finish. WD40 and a decent wax polish are a must. For tools, various screwdrivers and Allen keys to remove the bodywork. You are allergic to cleaning chemicals – although that’s a piss-poor excuse because you could wear gloves. 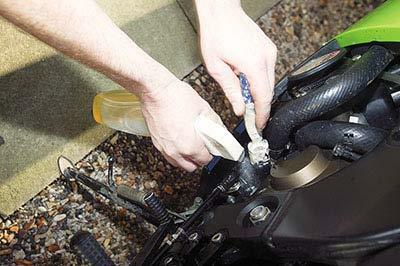 The basics of basic maintenance: water, cleaning products and the chance to understand what certain parts of the bike do because they’re in front of you. Nothing. No really. 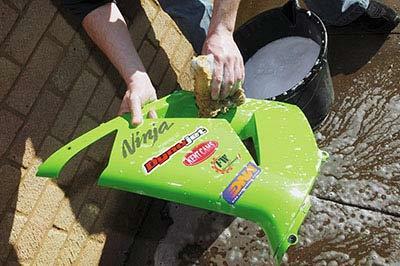 If you think you could drown in the bucket of soapy water then you shouldn’t be in charge of a bike. The ability to realise that dirt goes deeper than the bodywork and the ability to undo fairing fasteners. 1. 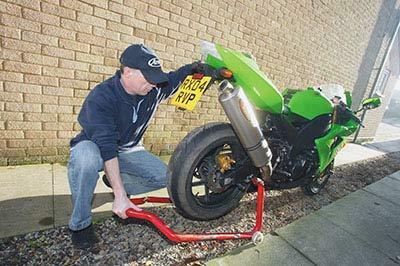 Hook up the hose to the pressure washer or spray nozzle and then place the bike on its sidestand, or, preferably, on a paddock stand to get access to the entire bike and to make turning the rear wheel easier. 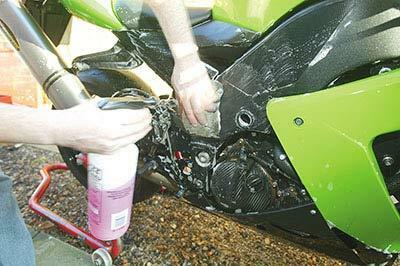 The bike really needs to be cold or the cleaning agent/soapy water will quickly dry on any hot parts. 2. First apply chain lube to the chain to stop water/cleaner getting into the linkages. Apply degreaser with a cut-down paintbrush to collected oil and grease (rear rim, front sprocket area, swingarm, etc) and dab it off. Take care not to soak bearings (wheel hubs, steering stem) or the chain as these will dry up and seize. 3. 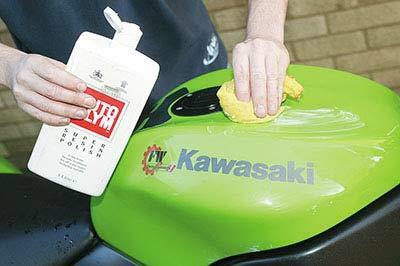 Spray the whole bike with cleaning agent. Go heavy on really dirty areas, a slight mist on parts like the tank, screen and switchgear. 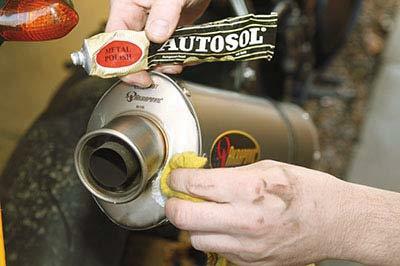 Spray as much as you can on to the front of the engine where road grime collects. If need be, agitate soiled panels with a soft cloth or sponge. Bug removal sprays are available for splattered screens. 4. Fire up the pressure washer or hose. The idea is to blast away the now loose dirt to prevent scratching when washing with soapy water and sponge. Start at the top of the bike and work downwards. Don’t aim directly at the switchgear and areas with bearings. Use a softer fan spray to clean the radiator or its soft fins will get broken. 5. Take the bike off the paddock/sidestand. Grab the bars firmly and lean the bike over on to your knee, then go round to the other side and repeat – this helps trapped water drip free. Put the bike back on to its stand and remove the fairing. Soak up any excess water from around the engine. 6. Apply more cleaning agent to areas which couldn’t be reached with the fairing on, such as between radiator and cylinder head, the lower part of the engine cases and so on. Use the hose/washer to blow it all off. 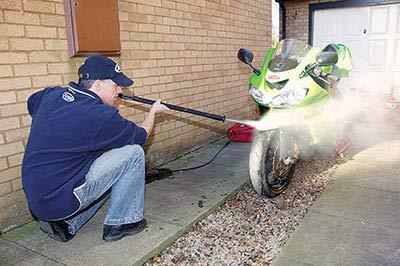 Take care not to hit delicate parts such as the battery, ECU, airbox, carbs, etc. Protect these areas with plastic bags. 7. Now mix the soap/shampoo solution with warm water in a bucket. Wash the removed panels with a soft cloth and then rinse off with clean water. Leave them to dry while you then wash the rest of the bike. Again, be careful when washing delicate areas (switches, ECU, etc). Rinse off with a softer spray of cold water. 8. Remove excess water in the same way as before. 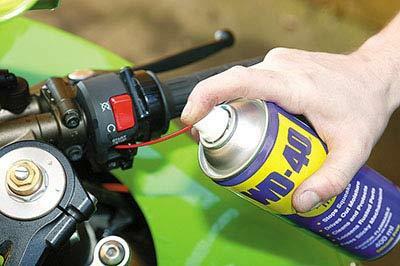 When the bike is dry apply WD40 to any working parts such as the switchgear, throttle linkages, etc. You could also put it on your wheel rims – it makes cleaning them a lot easier next time they’re washed – for a good shine, but wipe down with a cloth to prevent it getting on the tyres. 9. Put whatever bodywork you took off back on. 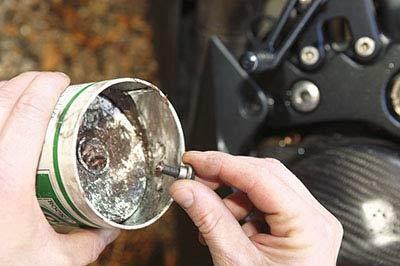 Grease up fastener threads with Copaslip grease. Grease up lever pivots with… erm, grease. If there’s any water left in niggly areas (indents in the frame where spindles sit, Allen bolt heads on the fuel cap) soak up with kitchen roll to avoid water stains/corrosion. 10. Bikes get hammered with road grit. If you see chips then it’s best to fill them in with touch-up paint from your dealer. If there are just surface scratches – you always get small scratches when washing – buff them out with T-Cut renovation cream. This stuff’s particularly good at getting rid of flies. 11. If the bike has a stainless/chrome/ally can and there are other areas of bare aluminium (rearsets, footpeg brackets, etc) which have stained or been scratched, then set about them with Autosol metal polishing cream. It takes time to get a good finish but persevere – it’s worth it and it won’t take nearly so long to clean next time. 12. Time to get busy with the polish. Recognised brands tend to perform better and it doesn’t matter if it’s a liquid or solid type. Use as per the manufacturer’s directions. Don’t use silicone spray for a shiny finish, the stuff soaks into plastic/paint and is impossible to spray over if the panel ever needs to be repaired.